Pssst… we want to let you in on a little secret. Ohiopyle is a lot less crowded and A LOT more fun if you are here during the week! We know most people work the standard 9-5 Monday through Friday shift. But if you are able to get away during the week, Ohiopyle is a great place to explore when there aren’t quite so many people around! As an added bonus, we are offering some GREAT weekday specials. 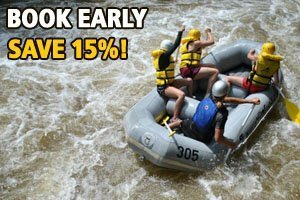 Spend an hour on the Adventure level at the Ohiopyle Zip-line Adventure Park in the morning and then raft on our afternoon Lower Yough Express tour for just $83 per person! This package is valid for Monday through Friday only. Mention promo code RAP18 when making your reservations for this great deal! 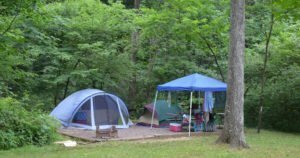 Come camping in a walk-to tent site at Yough Lake Campground anytime Sunday night through Thursday night and raft on the Lower Yough Guide Escorted tour for just $99 per couple. That includes one night of camping at a walk-to tent site and two spots on our Lower Yough Guide Escorted tour. Mention promo code RCW18 when making your reservations for this great deal! So whether you combine a whitewater tour with camping or zip-lining, you’re going to have a blast and save a lot of money. See you soon in Ohiopyle. *Please note: these prices do not include state park fees. These discounts apply only to NEW reservations. Not applicable with any other discounts. Some restrictions may apply. 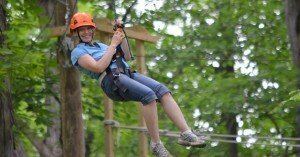 ← Top 10 Things to Do in Ohiopyle!